Daly, Carson — NBC has renewed the perennial late night show Last Call with Carson Daly. But we didn’t need to herald it here. Inevitably you’ll catch Last Call with Carson Daly in the same way you likely have always caught Last Call with Carson Daly: after falling asleep watching TV, you’ll wake up to see Carson Daly on your NBC channel in the middle of the night, and as you click the remote to turn off your television you’ll think to yourself, “wow, that’s still on?” Yes, in fact, it is! 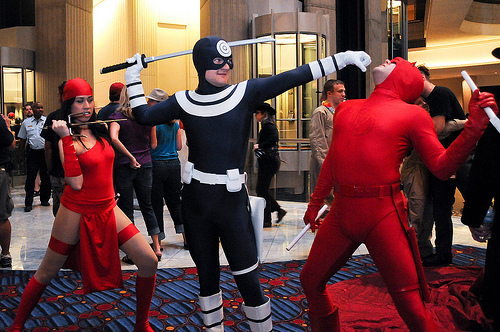 A scene from Fox's upcoming Daredevil remake. Daredevil — Twilight: Eclipse director David Slade has been tapped to helm a reboot of the Daredevil superhero franchise for 20th Century Fox Pictures, resetting the button on the original Ben Affleck version of 2003 and successfully proving once again that in Hollywood today, you don’t even have to try to do anything right the first time. Gaga, Lady — The flamboyant songstress followed up a recent concert in Louisville, Kentucky by dropping by a local drag bar and putting on a surprise performance for the patrons. As far as Lady Gaga numbers go for that evening, hers was fourth best. HGTV — Anthony Sayers, HGTV Canada’s co-host of a homeflipping program called The Unsellables, has been called onto the carpet under very serious allegations of criminal harassment over work done at the home of a Toronto woman. The woman alleges that Sayers repeatedly called her at all hours of the night, leaving threats that he would not leave her alone until she seriously began to consider replacing her standard xeriscape style backyard with a mediterranean-style terraced garden. Pie, American –– Universal announced yesterday that it has plans to reunite the entire cast of 1999’s massively successful comedy hit American Pie for a fourth movie — and has already garnered signatures on the dotted line by Pie stars Jason Biggs, Seann William Scott and Eugene Levy, with negotiations with the rest of the cast in the works. So if you wondered how long it would take to blow through American Pie kind of money, the answer is, officially, twelve years. Situation, The — Jersey Shore and Dancing with the Stars featured reality player Mike “The Situation” Sorrentino appeared on the Comedy Central Roast of Donald Trump this week and performed so terribly he faced boos from the crowd and an early departure from the podium. Don’t worry, Situation — in a few years no one will even remember this. Or you.